This site has been designed to provide Basic C programs for all beginners to learn and understand C programming language very easily, solved example programs of various categories for the school and college going students to learn C language in depth, Interview based Multiple Choice (Objective Type) questions and answers for the viewers whoever want to have more knowledge in C programming language. Moreover, this site has to include number of C programming Quizzes and C programming mock tests for the viewers to learn C language programs more on logically, mathematically, and conceptually. This Website is now under construction ! Coming Soon !!
. . . Odd or Even . . .
. . . Armstrong number . . .
. . . Perfect number . . .
*c program to check whether a number is perfect number or not. * C program to display Perfect numbers between given range. * C program to display the Perfect numbers between 1 and 100.
. . . Prime number . . .
. . . Strong number . . .
* c program to check whether a number is strong number or not. * C program to display Strong numbers between given range.
. . . Palindrome . . .
. . . Roots of Quadratic Equation . . .
* C program to find the Roots of Quadratic Equation.
. . . Fibonacci series . . .
* C program to print Fibonacci series using an Array. * C program to find the Sum of Fibonacci series.
. . . Series . . .
. . . Factorial . . .
* c program to find the factorial of an integer number.
. . . Stack Operations . . .
. . . Swap two Numbers . . .
. . . Calendar program . . .
. . . Simple Interest . . .
. . . Smallest and Largest . . .
. . . Ascending & Descending order . . .
. . . Arrays and Pointers. . .
. . . Using Pointers . . .
. . . Conditional Operator . . .
. . . Using Function . . .
. . . Using Recursion . . .
. . . Matrix . . .
. . . Strings using Character Arrays . . .
. . . Decimal to Binary Conversions . . .
. . . Mixed Number System Conversions . . .
. . . Algorithms Implementations . . .
. . . Temperature Conversions . . .
. . . Electricity Bill . . .
. . . Sum . . .
. . . AREA . . .
. . . ASCII values of all Characters . . .
. . . Student Mark Sheets Using Structure . . .
. . . Files . . . 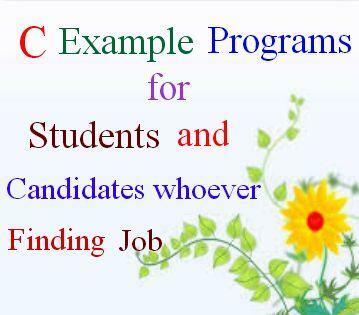 This site contains Basic C programs for all beginners, solved example programs of different categories, Interview based Multiple Choice (Objective Type) questions and answers for the readers to have more knowledge in C programming language.